posted: February 08, 2016 by: PetCare Animal Hospital Tags: "Clinic Specials" "News"
From time to time we receive some of the nicest communications from our clients! These are messages thanking us from helping them and their beloved pet, telling us what their puppy is up to, sharing their experiences here....the lists go on and on! We would like to use this page as a forum to share with you some of these communications. If you have a fond memory of when you brought your pet in or any messages you would like to share with the staff and other pet owners, please email us at petcarevets@petcarecincinnati.com! Here are some messages we have already received! The staff is very passionate about each 'patient' that comes through their doors. It is quite refreshing. They are always very friendly, helpful, and knowledgeable. Eric does am AMAZING job on making my little pup look super handsome each time. Super awesome place with amazing people. We have always been more than happy & we are glad you are more than available! There's no need to change a thing. Dr. Hill and staff go above and beyond to take care of their patients. 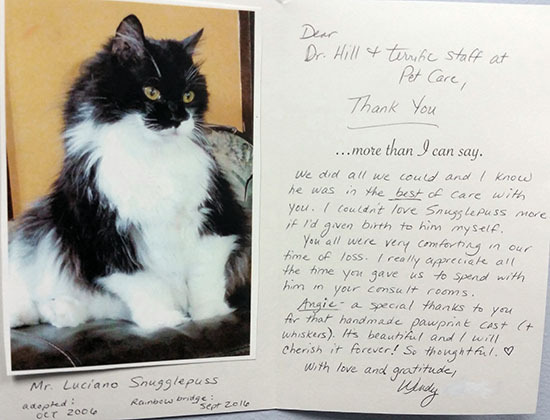 Rococo gets great care at PCAH from Dr. Hill & all the staff- close to 21 years now. Not sure it could get any better. I am lucky to have people I trust completely with my fluffbutts. Very professional, caring, and friendly staff!! I wouldn't take my pet anywhere else!